Monterey Media‘s The Red Baron shows a different side of the famous pilot Baron von Richthofen from what the legend suggests. The war movie examines modern warfare through the experiences of one of its most famous practitioners, a young man, praised for his skills to destroy, until he learns the consequences of that destruction. The World War I flying ace (played by Valkyrie‘s Matthias Schweighofer) is painted as an eager, ambitious kid who’s not so concerned with war and killing the enemy as much as being the best pilot who shoots down planes. In fact, he sees honor in not killing the pilots of the planes he shoots down, and he builds a mutual respect — if not friendship — with his British counterpart (Joseph Fiennes of TV’s Flash Forward). But the realities of the actions of those who give orders starts to weigh on him. Lena Headey (300) stars as the nurse who attracts the Baron’s eye, and Inglourious Basterds Til Schweiger rounds out the cast. Fiennes, who’s the most recognizable face of the drama movie thanks to his current television starring role as well as 1998’s Shakespeare in Love, actually only has a small amount of screen time. The performances are uniformly fine, as are the script and direction. The standout for the movie are the visual effects of the war planes battling in the sky. 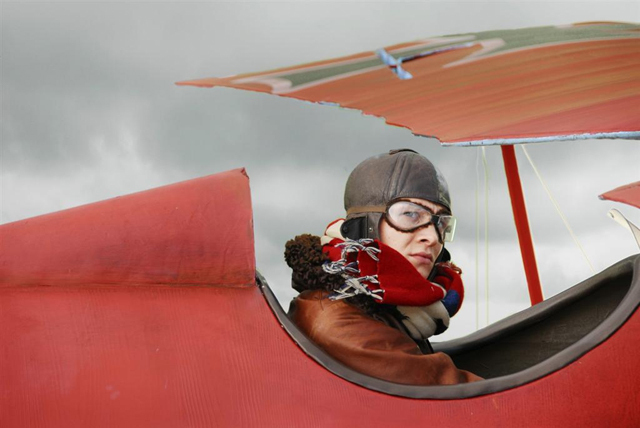 For an indie film that lacks the budget of most effects-heavy movies, Red Baron scored some fantastic scenes. The drawback, however, is that when we might expect to see a great flying scene, sometimes there is none, as the filmmakers obviously saved the budget for the biggest battle scenes. One such case is the inaugural flight of the famed red airplane. The DVD includes a making-of featurette of the independent film as well as “Legends of the Red Baron,” both of which extend the movie experience nicely.